For our January recipe roundup we'll be featuring citrus fruit! Citrus fruit is in season during January and it provides a bright burst of colour in an otherwise rather dull month! We want your very best citrus recipes - the brighter, more colourful and cheerful the better! We want to push away January doldrums and the citrus colour palette does just that! Before submitting please ensure the recipe you choose fits the criteria listed below. Please avoid submitting photos with text on them. The Citrus Fruit roundup will run the week of January 11th, 2016 and depending on how many submissions we get, it may run over a few days. If you've never submitted to one of our recipe roundups before, here’s a few to check out: Apple Recipes, Pumpkin Recipes, Grilling Recipes, Christmas, Grey Cup…. Read the submission guidelines below and send us your best recipe link! While we normally feature every recipe submitted, due to the sheer volume the last few recipe roundups have generated we will be tightening up our submissions guidelines. If you follow our submissions requirements, we will include you. Posts should be contain a citrus fruit recipe and must be from your personal blog. You may submit one post – please, do not send multiples and ask us to decide! 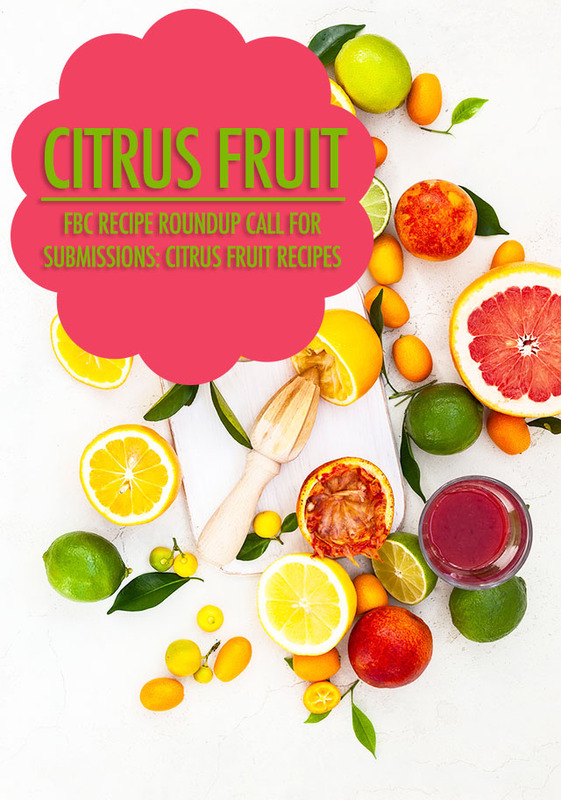 Send a link to your post, your first and last name (we will only publish your first name), your blog name and ONE image 640px wide, to Melissa by 5pm PT, Dec 31, 2015 with the subject line: Citrus Fruit Submission. The number one reason posts are not included in our roundups is because the photo is the wrong size. It MUST be 640px wide. We hate having to exclude anyone especially when it's a great submission but if your image is larger or smaller than 640px wide (no limit on height) we won't be able to include you. Try to send your best photo from the post - good photos encourage click throughs to your blog and we will pin the image you submit to our appropriate pinterest boards. Please avoid submitting photos with text on them. Roundups will be published the week of January 11, 2016. Please note, due to the volume of submissions we receive, submissions that do not fit the above criteria will not be considered so please ensure your image is the correct size. We’re looking forward to seeing what you all submit! where do we submit our entry to? Hi Ratna, it tells you in the post – there’s a link to the email address you should submit it to!